Pardon Me, Good Fellow… May I Introduce Gentleman Caller Claptrap? You are here: NECAOnline.com » Blog » News And Announcements » Pardon Me, Good Fellow… May I Introduce Gentleman Caller Claptrap? According to our Victorian-era guide to etiquette, a proper introduction involves a calling card, a silver tray, a doorman, and some other stuff we couldn’t read due a sudden onset of terminal boredom. So just pretend that we did all that, OK? After the incredible response to the original Claptrap, the Limited Edition Blu14 Claptrap and the Jakobs Claptrap… we are extremely excited to present the Gentleman Caller Claptrap! Gentleman Caller Claptrap sports his formal tuxedo, a mustache, a top hat, and a monocle. 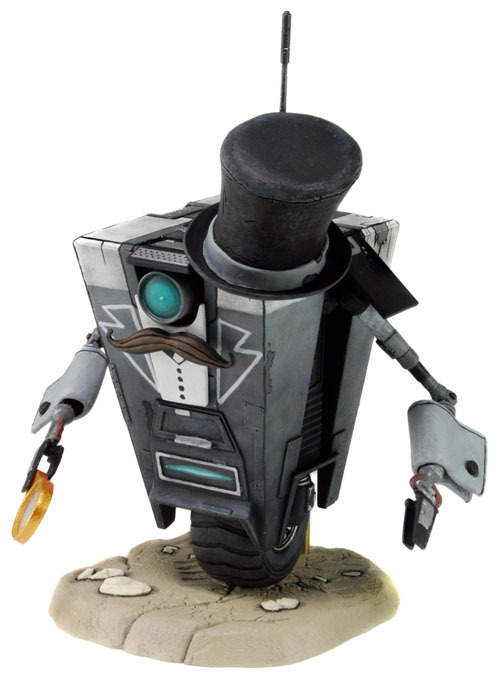 The 7″ scale figure includes a display base, is fully poseable, and features all new unique decoration to simulate his appearance as the Claptrap who runs the Bank in the Borderlands game. Gentleman Caller Claptrap will be hitting stores in mid-December. Stay tuned for more updates and product shots as we get closer to the release date, and be sure to let us know what you think on Facebook and Twitter!